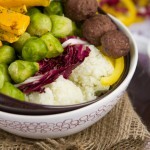 Grain-free “rice” bowl that’s loaded with veggies, homemade mini meatballs and topped off with a (dairy-free) creamy rosemary sauce. Place sliced butternut squash, marjoram and olive oil on one side of the pan, flip to coat. On the second side, place mini meatballs. Cook in the oven for a total of 25 minutes, rotating the squash halfway through and removing the meatballs after 10 minutes, or until their internal temperature reaches 165F. Meanwhile, pulse cauliflower florets just until broken down and the same size as rice. Place in the bowl of your steamer and steam for 2 minutes. Remove from heat, drop into a strainer and allow to sit for a couple of minutes. 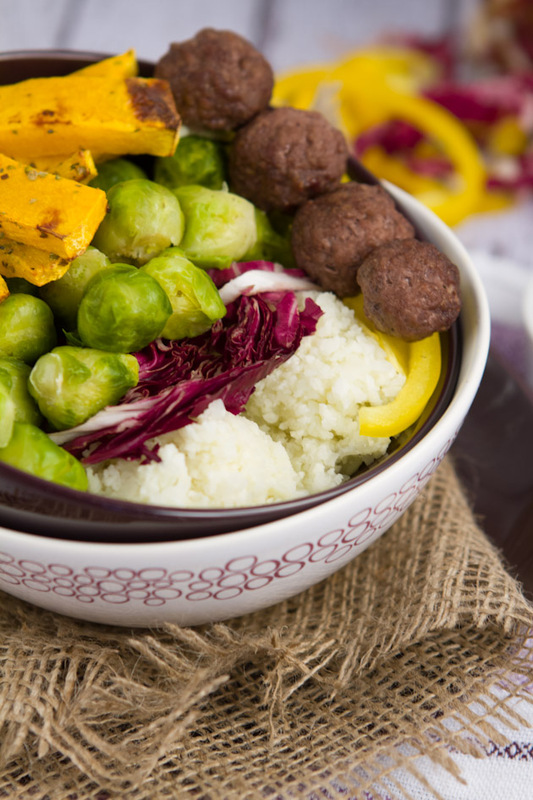 To assemble: begin with a bottom layer of “rice” then cabbage, cooked Brussels sprouts, roasted squash, and side layer of sliced bell peppers, topped with cooked meatballs and pour on the dressing.